artificial parts, practical lives | Abler. 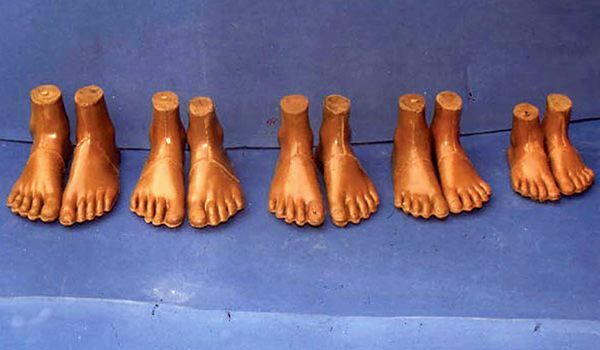 “Histories of prosthetics are probably better written by playwrights than by historians. The stories are full of contradiction, emotion, creativity, intrigue, and myth, gestures that are fraught with meaning, and sometimes improbable (but more often than not, tedious) events. There is the young woman, a double leg amputee, deciding what height she would like to be and her preferred shoe size as she is fitted with new legs. Another young woman, born without arms and legs, decides to forego the use of any prosthetic limbs. Police in 1905 arrest a notorious woman who rides in public conveyances and uses artificial arms and hands seemingly to read a book, while her real hands pick the pockets of commuters seated beside her. In Tokyo, a yakuza decides to leave the gangster brotherhood but needs to replace the finger cut off during initiation. A 1930s housewife, recovering from cancer surgery, struggles to pay attention as her physician explains how to sew an artificial breast. A twelve-year-old wunderkind cellist inadvertently leaves her custom-made arm in a New York City taxicab. Soldiers in 1865, 1898, 1918, 1945, 1953, and 1986 wait for the government paperwork that will pay for their prostheses. What ties all these people together, besides visible bodily difference, is that each person enlists and integrates artificial parts in the practical details of daily living. But it’s the material culture and social origins of these technologies that get explored in this anthology—stories that are no less lively and provocative for having their roots in people’s lives—whose experiences of mobility or capacity, in several senses, have been negotiated and re-configured and interpreted in the course of daily life, in specific contexts. The collection includes the DIY prosthetic breasts, made of cotton and sewn by the post-mastectomy patient herself, that preceded silicone technology; the aesthetics and market developed for the Jaipur Foot prosthesis in India; and the material development of artificial eyes, hip replacements, and of course, war-wounded veterans, whose post-conflict identities and rights have long entailed important decisions about synthetic replacement parts. I think each of these scholars would agree that the “prosthetic” will continue to be a favored metaphor for the ways we understand ourselves at work in the world—and will continue to animate the debate about how old a hybrid identity really is. And we’re likely to continue to worry over our “replacement parts” and seek out stories that speculate about the artificial and the authentic. But consuming the metaphor only risks obscuring the political and cultural histories of these parts and the people who’ve designed and deployed them for all kinds of ends. Some of the stories will follow here. I took a class from Katherine Ott at AU. She’s hilarious and really an interesting thinker. No surprise that the book is a valuable addition, too. Small world! I love that. Several newly-met colleagues have suggested I contact her—will relay this good memory.